Boys become scouts for different reasons. Very often, they join because they want to have fun with their friends. Sometimes they are simply following in the footsteps of an older brother. Other times, what makes them join is the invitation of a scout leader or the encouragement of a parent. It would be the rare boy who joins Cub Scouts or Boy Scouts because he wants to develop self-discipline, learn to cook, or strengthen his sense of duty to God. Yet all of these are essential elements of the program offered by the Boy Scouts of America. What made James White join? He cannot be sure why he joined, but it probably had something to do with his two older brothers and his father, all of whom were involved with Troop 187 in Sellersville. Initially, White was not particularly enthusiastic about scouting because he was involved in many other sports and activities. So what made him stay involved? “Friendship is what keeps you coming back,” he said. His friendships must have been strong because White recently earned the rank of Eagle Scout, presented to him at a Court of Honor last fall. When White joined scouting as a young grade-schooler, he certainly could not have been aware of all the adventure that lay ahead. He could not have guessed that he would climb 14,000-foot mountains in New Mexico, earn the Eagle rank and become a seasoned leader of his peers — all before reaching the age of 18. Eagle Scouts in the Philadelphia Archdiocese proudly display their hard-earned medals alongside parents and scout leaders. Nor, one suspects, would he have expected to be among few scouts in the area to earn the Catholic Scout Award. This special award is presented locally to scouts within the Archdiocese of Philadelphia who have earned all four of the religious emblems available to them. It consists of a patch that can be worn on the scout’s uniform shirt. The National Catholic Committee on Scouting offers the Light of Christ emblem for 6- and 7-year-old Cub Scouts and Parvuli Dei (“Children of God”) for 8- to 10-year-old Cub Scouts. These programs are intended to be earned in the context of the scout’s family. The Ad Altare Dei (“To the Altar of God”) medal, which is open to all Catholic Boy Scouts (ages 11-18), highlights the role of the seven sacraments in the life of faith. Lastly, the Pope Pius XII emblem is a discussion-based program open to scouts who are at least 15 years old. It explores the variety of vocations available in Catholic adulthood. Scouts in the Eastern Catholic Churches also have a religious emblem available to them. This medal program is called Light Is Life and is designed for scouts who are 12 and 13 years old. White enjoyed working on each of the four emblems, but especially the two medals designed for older scouts. “For the first time, I would simply have discussions about faith and all its aspects with other young Catholic scouts, which was really a great thing to experience,” he said. The leaders of Troop 187 encourage all their scouts to pursue the religious emblems offered by the boys’ respective faiths. They have seen firsthand how these programs can affect young men in profound ways. One summer, White had the opportunity to go with a group of his Scout friends to Philmont Scout Ranch, a 137,493-acre wilderness camp in the Sangre de Cristo Mountains of northeastern New Mexico. He was chosen to be the crew chaplain. Serving in this capacity gave him “the chance to bring the religious aspect into our trek, always leading grace at every meal and even conducting a prayer service” while in the backcountry, he said. Regardless of what made him join or what convinced him to stay, White has become a model scout, well decorated with awards and well respected by his peers. In the form of the religious emblems program, the church has accompanied him along every step of his scouting journey. 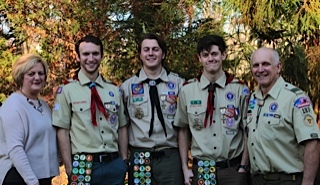 “Being an Eagle Scout means much more than that I simply ‘fulfilled all the requirements,’” White said. 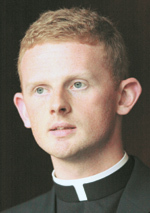 Father David Friel is archdiocesan scouting chaplain and a parochial vicar at St. Anselm Parish, Philadelphia.